This is a preliminary report based on our 2007 dig at the Newport Tower. Details will be added so check back. Also watch for updates to our "On Location" page for photos and daily log of the 2007 season. Last updated January 8, 2008. In 2006, The Newport, Rhode Island, City Council graciously allowed the Chronognostic Research Foundation and archaeologists of Gray & Pape, Inc., Providence, to conduct an archaeological investigation in Touro Park. The two groups aimed to discover new evidence for the origin of the Newport Tower. That part of the project took place from October 16 to November 22, 2006, when time ran out to complete the work. When the Foundation asked to finish the work in 2007, the Council again graciously gave its welcome permission. The 2007 work took place from October 9 to November 13. The Foundation is delighted to reveal what has been found and what we can make of our discoveries. We now know that the Newport Tower was probably not built by 17th-century British Colonial settlers. When ground-penetrating radar (GPR) was conducted in 2003, 2005 and 2006, an 18 x 20-foot site east of the Tower was especially worth investigating. The GPR indicated a very dense site, so we concentrated on its boundaries and contents. We?ve discovered what could be a building foundation that was filled in completely - not once but twice. The artifacts, primarily pottery, glass, nails, and other household debris from the lower layer date the first fill to the 1850s, at the time the park was created, about 1855 to 1857. The second fill dates from the end of the 19th century - again, the artifacts allowed us to date that time frame. What would have been the reason for another fill? Perhaps the park was renovated for centenary celebrations of 1900, at which time a bandstand was built, and the foundation hole, probably sinking again, was filled to bring it level with the rest of the park. Under these dumped layers is a layer of native stones. The stones tell us that there may have been a structure east of the Tower. This is important because our research has shown that there were no structures around the Tower since the town?s founding in 1639. A painting attributed to Gilbert Stuart, painted about 1770-1775, also shows an open meadow around the Tower, with no structures near it. Click here to see a full size PDF of the illustration of the fill layers shown. We discovered at least four path systems: pea gravel from the founding of the park before 1860, then simplified in 1907, changed again in 1921 and, finally, in 1949, when the asphalt paths were laid that exist today. We?ve also determined the exact location of the bandstand: its outline is still visible east of the flagpole, as a circular depression in the asphalt path. The most important message about the Tower comes, not from the park around it, but from the building itself. The Tower stands at 86 feet above Narragansett Bay. In its early days, it was located in an open meadow with a clear view of the bay and surrounding landscape, including what is now known as Jamestown Island. We have rediscovered what many persons have known before: the Tower lies about 1-1/2 miles exactly due south of Miantonomi Hill. Click here to see the full size pdf illustration of the Tower location. From the November 2007 meeting of the New England Antiquities Research Association (NEARA) in New London, Connecticut, an interesting fact emerged: the sun sets on the Summer Solstice (around June 21) at a bearing of 302° at Newport?s latitude (N41° 29?). A bearing, which is measured clockwise from North, is equivalent to 58° measured East of North as shown in these illustrations. 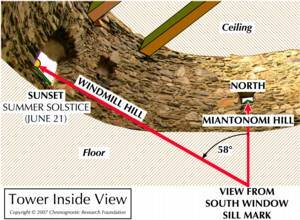 A line drawn from the Tower along that bearing on a map, crosses the highest point - Windmill Hill - on Jamestown Island. The north-south line and the bearing line intersect and determine the Tower?s location. Once the Tower?s location is established by the orientation to north and the Summer Solstice, the Tower?s windows, by their location in the walls and their shapes, are no longer a mystery. From inside the Tower, on its first wooden floor, a person of about five feet five inches tall, standing in front of a point marked in the sill of the south window, could see the summit of Miantonomi Hill through the very small north window. Above the hill, in the sky in the same direction, is the North Star - Polaris. Click here to see the full size pdf illustration of the Tower window orientation. The builder had to start with Polaris, but the star is visible only at night, so he also needed a northern point in the daytime. With these two points from which to work - Polaris and Miantonomi Hill - he could establish his north-south line. When he bisected that line, he had an exact east-west direction which, on March 21 and September 21, are the Vernal and Autumnal Equinoxes. On both Equinoxes, day and night are of equal length - 12 hours - and the sun rises due east and sets due west. The builder could align his structure for the Equinoxes easily, with an accurate east-west line. The Solstices were more complicated to depict. The builder used the south and west windows to do the job. Each window features double-splayed sides - in other words, the side of the windows look like this: > < . For each window, the angles of the splays are slightly different. 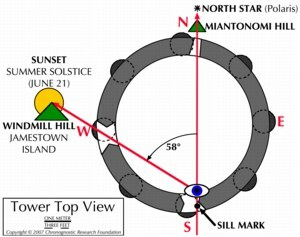 To use them, the viewer stands at the point marked on the south window sill and looks through the west window, along the angle made by the splay; now he is not looking through a whole window but just a slot, and he sees - on only one day of the year, - a spectacular sunset, over Windmill Hill on Jamestown Island, the highest point on the horizon. On that one day only ? the Summer Solstice, around June 21st ? the sun is visible from inside the Tower. Click here to see the full size pdf illustration of the Tower view from the inside. 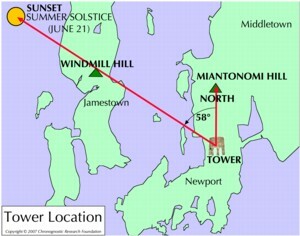 When we originally determined the summer solstice alignment to Windmill Hill on Jamestown Island we used the location of the sun on June 20, 2007. For the actual sun locations we used Starry Night astronomy software version 4. For 2007 the northern most point of the setting summer solstice sun is 302° 4.1?. This bearing puts the summer solstice line from the Tower nearly exactly over the historic wooden windmill on Windmill Hill. When we visited Windmill Hill we found the windmill just shy of the highest point on Jamestown Island by about 200 feet south. When we used Starry Night to find the location of the summer solstice sunset in the year 1125 we found it to be 302° 14?. This changes the bearing from the tower to 200 feet north and exactly over the actual high point on Jamestown Island. The builder built deliberately. He knew what he was doing. He understood the math, and how to choose the location for his celestial observations. The Tower was no accident. It was placed at its present location for one reason: to measure the Solstices and the Equinoxes. Why were these dates important to the builder and his period? Because, until 1457, people had few other ways to establish planting and harvesting dates, and the dates of the moveable feasts of the Christian Church. Prehistoric peoples built structures for the same reasons: to plant and harvest their crops, and to worship their gods at the proper times. Now we must try to assign a building date for the Tower. We can start with about 1121, when we know that a Christian bishop was in Greenland to find out whether the Greenlanders could afford to have their own diocese. At that time, early in the 12th century, representatives from Greenland had petitioned the king of Norway for a bishop, such as many areas in the North Atlantic already had: Iceland, the Faeroes, the Shetland and Orkney Islands, and the Hebrides Islands and the Isle of Man. Danish archaeologists found two cathedral churches at Gardar, one built above the other; the first, lower church, from the early 12th century, was associated with a freestanding, 80-foot, lime-mortared tower. We also know from the Icelandic Sagas that in 1121 the bishop, Eirik Gnupsson, left Greenland, setting out ?to look for Vinland.? The Newport Tower could have been built as late as 1457 - but probably not much later. That was the year Johannes Gutenberg issued the first printed almanac, the second book off his new printing press (the first was the Bible). Why would the second printed work be an almanac? Because the dates of the Solstices and Equinoxes - which calculate movable feasts such as the Christian Easter, and dates when farmers should plant and harvest - have always been so important to humankind. With this material in print, it was no longer necessary to build structures to measure those dates. Until then, Christian churches all over Europe had openings geared to measuring ?sun time,? and lines on their floors to measure dates. The earlier date of about 1125 seems more likely than the later date of 1457: the Tower has round, Romanesque arches, which weren?t used after 1150, when the pointed Gothic arch proved to be vastly superior for use in church building. The Newport Tower, then, could have been built in the 12th century. It might have been built in the 14th century by the Scottish Prince Henry Sinclair, who certainly sailed in North American waters; but it?s more likely that Prince Henry would have favored the Gothic style, then in vogue. The Tower is not early 15th century Chinese. 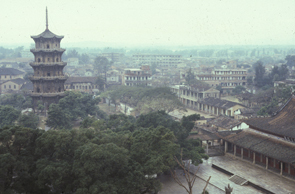 It bears no resemblance to the lighthouse at Quanzhou, on the South China Sea, which is a typical Chinese pagoda of five stories. Shown here is a view of the Zaiton Lighthouse in China (photo courtesy Jeremy Green, Western Australia). It?s unlikely that the Tower 16th-century Portuguese, because the construction is too rough. It has been likened to the Charola in the Convento de Tomar, Portugal, an octagonal feature inside the massive church; but the Charola is a complex, beautifully carved structure that dates, at its earliest, from the late 12th century. Finally, the Tower is probably not 17th century, in which case it was not built by Governor Benedict Arnold. Arnold certainly owned the land on which it stood, and he might have tried to make a windmill out of it, to replace Peter Easton?s windmill, which blew down in a hurricane in August, 1675. But Arnold and his contemporaries built almost exclusively in wood - their houses, churches, windmills, even their ironworks at Saugus, Massachusetts, with its two massive iron forges. So Arnold probably did not build the Tower. But he may have taken good care of his very odd building, just as Newporters have done ever since. And for that, we can thank him as well as Judah Touro, and the Newport City Council: all have preserved the structure for study in the 21st century. But more serious preservation is needed: the structure has suffered extensive damage over the centuries and has developed many cracks and other flaws. We of the Chronognostic Research Foundation hope that conservation measures can be taken to save this remarkable building. To do the job accurately, of course, requires that the conservationists know the specific era to which to conserve it. People will probably go on believing whatever they want to believe, but that?s not science, and we have been doing science, based on what we know of medieval and earlier building practices and astronomical observation. The Newport Tower, a structure used for the latter purpose, can exist in northeastern America as well as in Europe, Middle and South America, and the Middle and Far East. It is probably part of humankind's long tradition of archaeoastronomy. 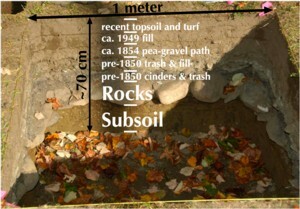 Final reports of the 2006 and 2007 archaeology in Touro Park are expected by April, 2008, and will provided to the City of Newport and published on this web site. The Chronognostic Research Foundation thanks the Newport City Council and the residents of Newport, Rhode Island, for their warm hospitality and the privilege of studying the most interesting structure in North America. Copyright © 2004 - 2019 Chronognostic Research Foundation, Inc.